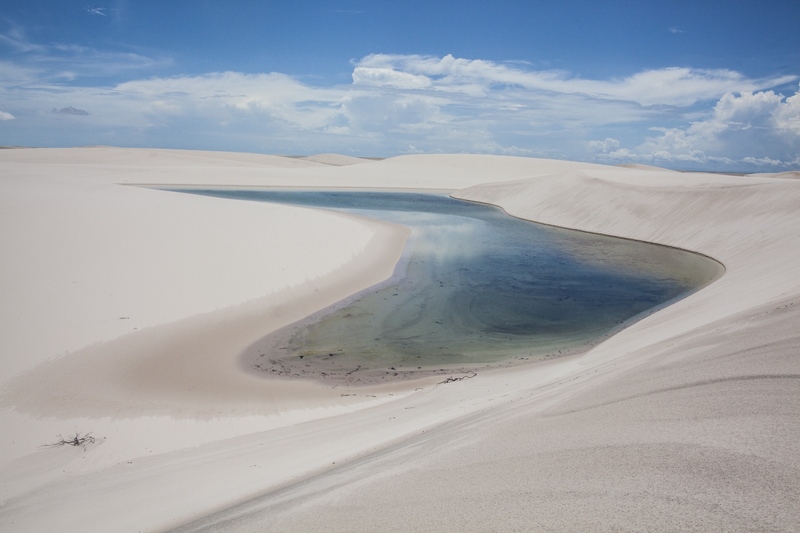 Surrounded by sand and lagoons in Lençois do Maranhão National Park, an area that stretches 155 thousand hectares on the State of Maranhão in Brazil, lives a small community in an oasis called Queimada dos Britos. 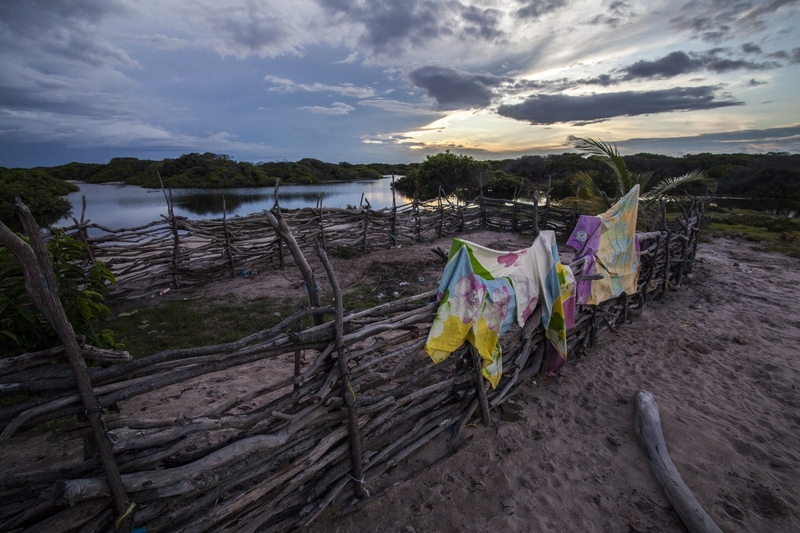 No one knows when the community was founded, but the legend says that the founder Manuel Brito, left his homeland in the Ceará State due to severe drought and ended up settling down in the oasis named by the locals as “the island”. Today his decedents continue to live on the oasis, often intermarrying with each other, turning every habitat into a relative. Around 60 people live in Queimada dos Britos, but the locals are not sure since there is always someone going away or coming back. During summers they live of fishing in the sea, that is two hours away, but during the winter, they breed fish in the lagoons and raise goats, which run free on the dunes. They have small gardens for farming, but nothing major since the dunes keep moving and will cover most of them, something that has to happen with several houses in the community. The closest village is four hours walking on the sand, but nowadays tourism is reaching the quiet life of Queimada dos Britos bringing some income, which is well received when the visitors step in. The downturn is that more and more agencies from nearby cities are bringing tourists into the park on motor vehicles, and locals claim affecting the environment and their peaceful way of life. 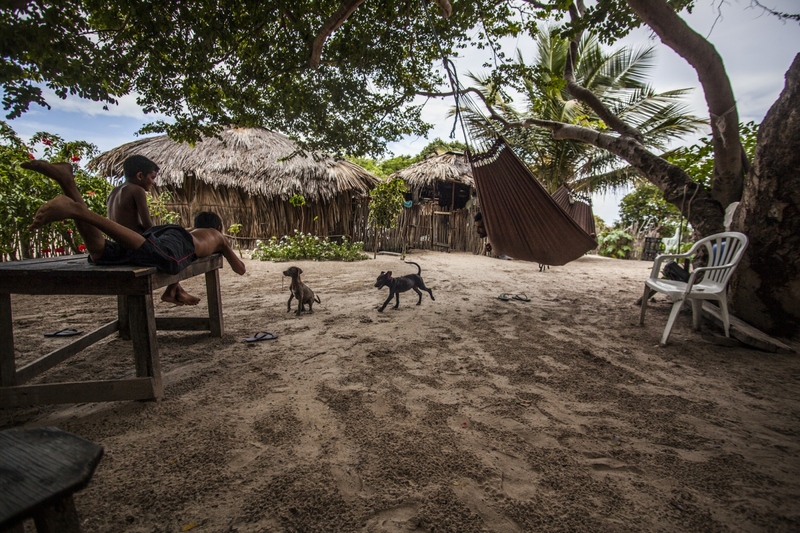 But not only their life is threatened by the tourists and the sand, but the Brazilian Institute of the Environment and Natural Resources (IBAMA) is also planning to remove them since they live in a National Park. The residents refuse to move since many of them were born there and lived all their lives in the Queimada. 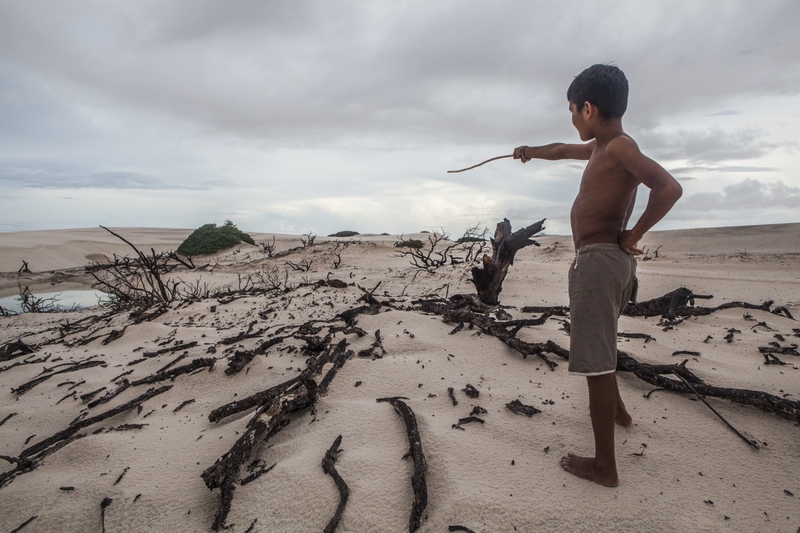 They claim that more than a threat; they are a protection to the Lençois do Maranhão. One of the Lençois do Maranhão lagoons during the Winter season. The sand filters the water from the rain and creates clear water lagoons. 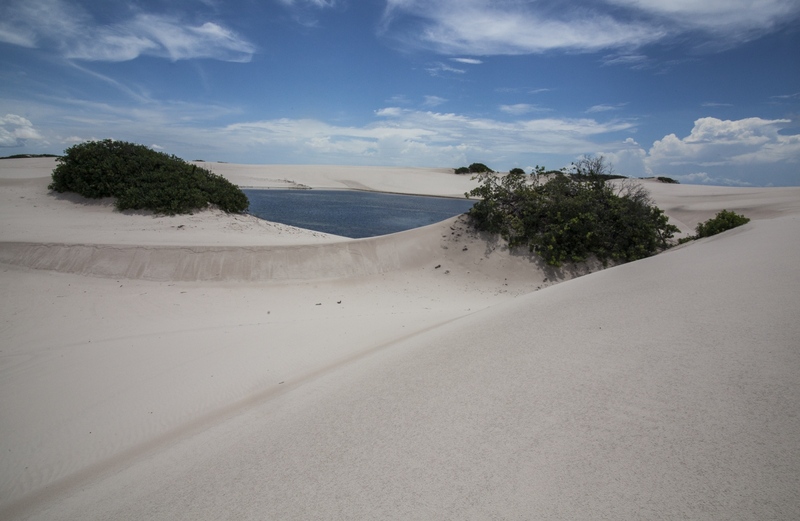 Lençois do Maranhão, a 155 thousand hectares National Park in the state of Maranhão, Brazil. 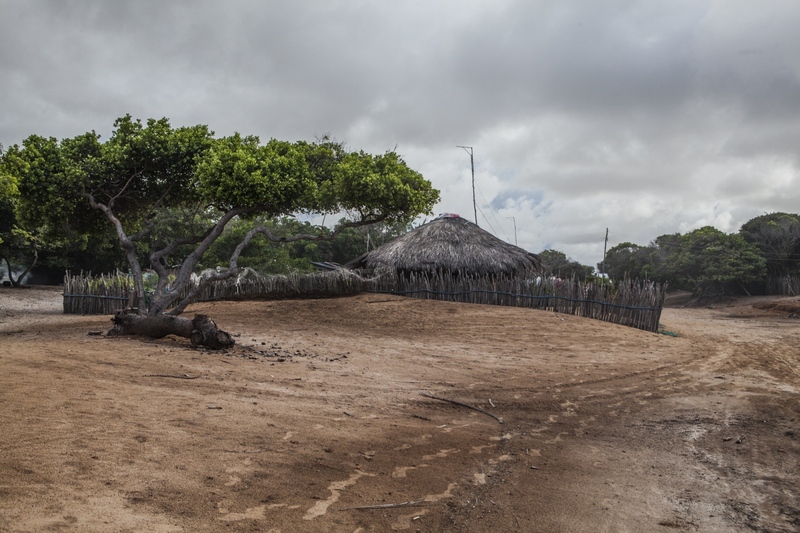 The house of Aldemir and Aurideia Brito on the oasis of Queimada dos Britos in Lençois do Maranhão National Park, Brazil. Usually the only access is by walking a few hours. 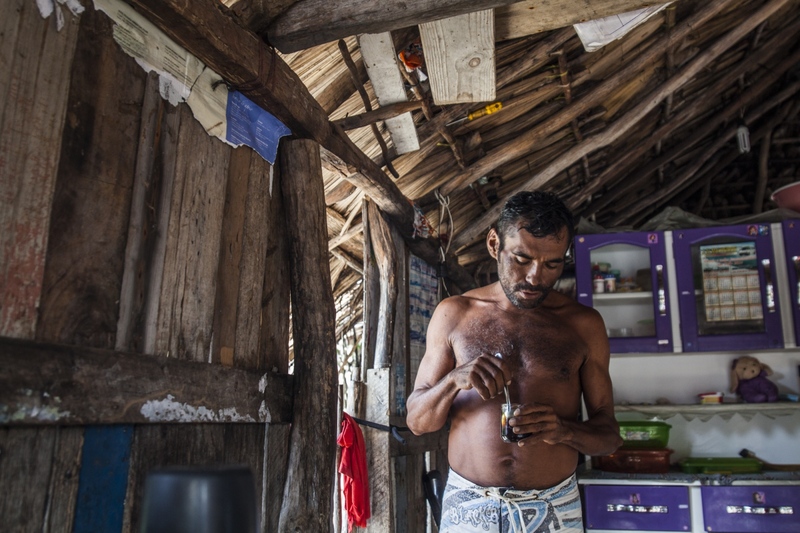 Aldemir Brito, 39, drinks coffee early in the morning in his house at Queimada dos Britos. 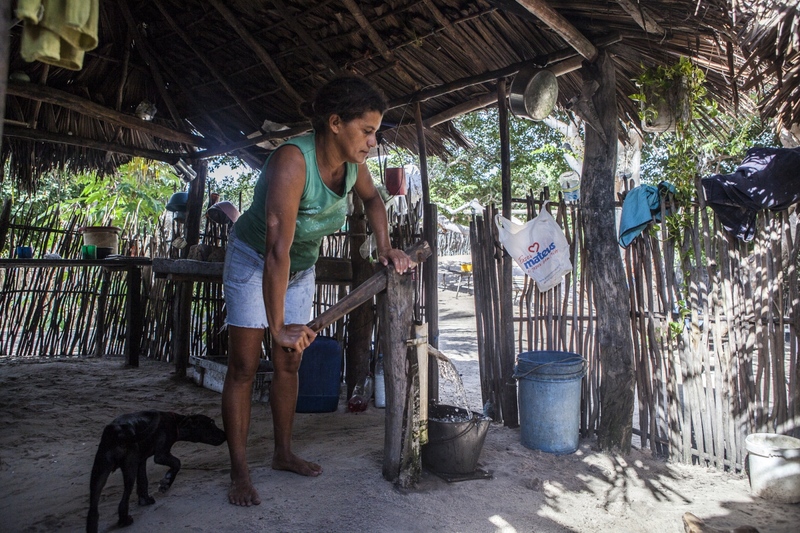 Aurideia Brito pumps water to prepare breakfast in her house in the Queimada dos Britos. Even during the harsh summers, they can pump water making it possible to live surrounded by desert. 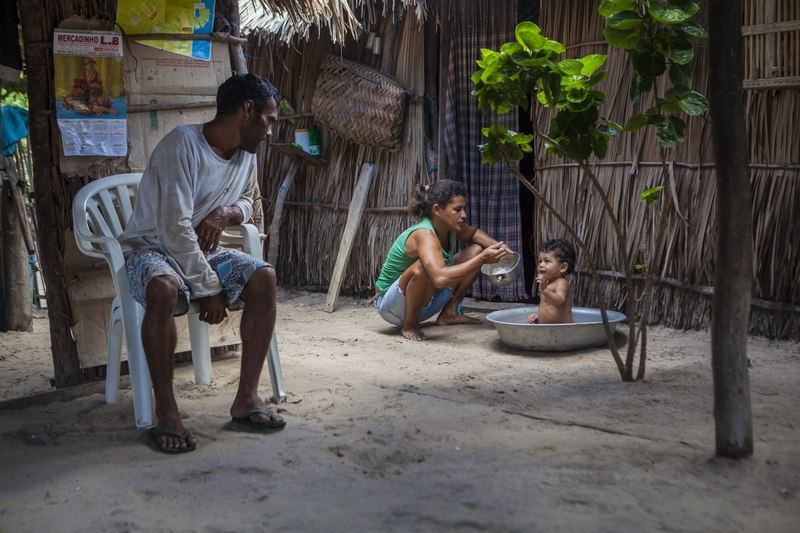 Aurideia Brito feeds her nephew while Aldemir watches them in their house in the Queimada dos Britos. 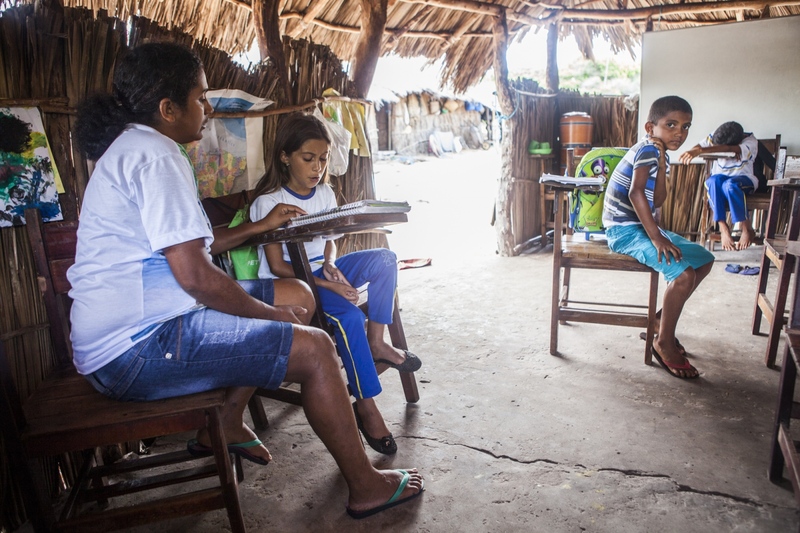 Joina Brito, 36, gives a lesson at the school set up in a shack to the few children of the oasis. She teaches 11 children, all being part of her family. She is been teaching the children for 16 years, when she replaced her mother. 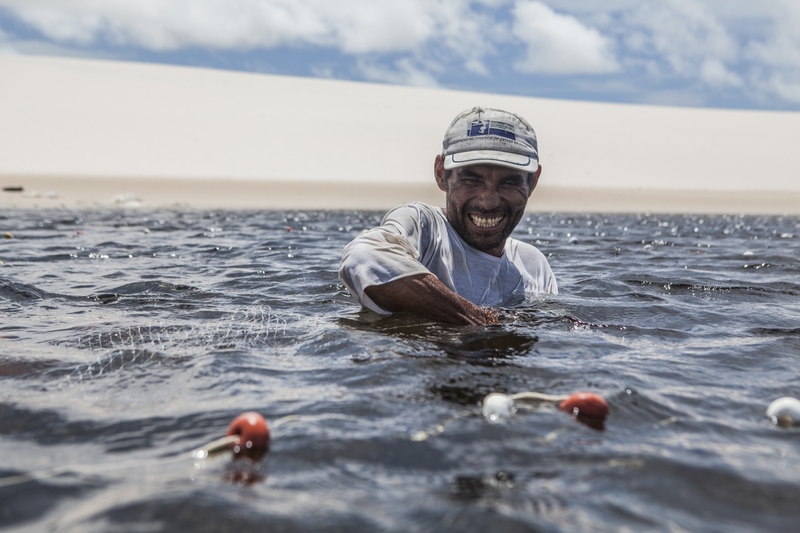 Aldemir Brito, 39, fishing in one of the lagoons close to his house in Queimada dos Britos. They live of fishing, which is two hours away. In the winter they breed fish on the lagoons, and cattle and goats that run free on the dunes. They have a small garden for farming but nothing major since they are afraid of the accelerating advance of the dunes that have already covered several houses. 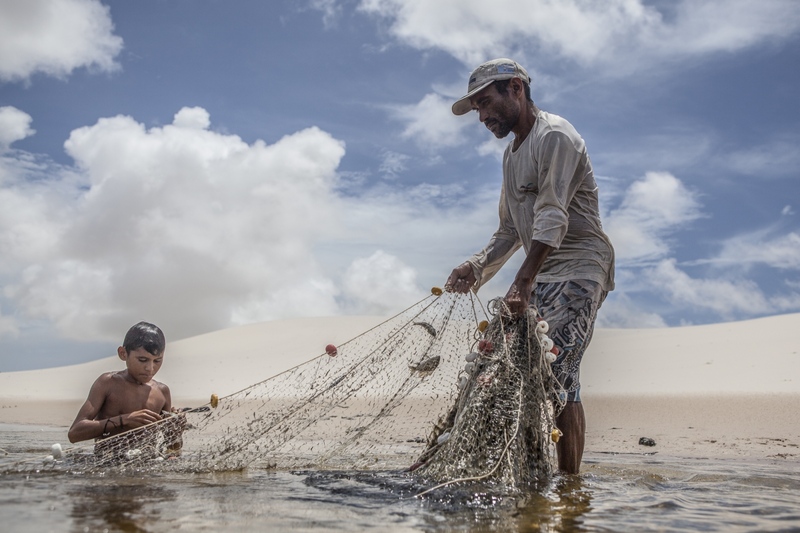 Aldemir Brito, 39, fishing with his son Adriel, 13, in one of the lagoons close to his house in Queimada dos Britos. The knowledge of living in the dunes is passed from father to son for generations. They live of fishing in the sea, which is two hours away. In the winter they breed fish on the lagoons, and cattle and goats that run free on the dunes. They have a small garden for farming but nothing major since they are afraid of the accelerating advance of the dunes that have already covered several houses. 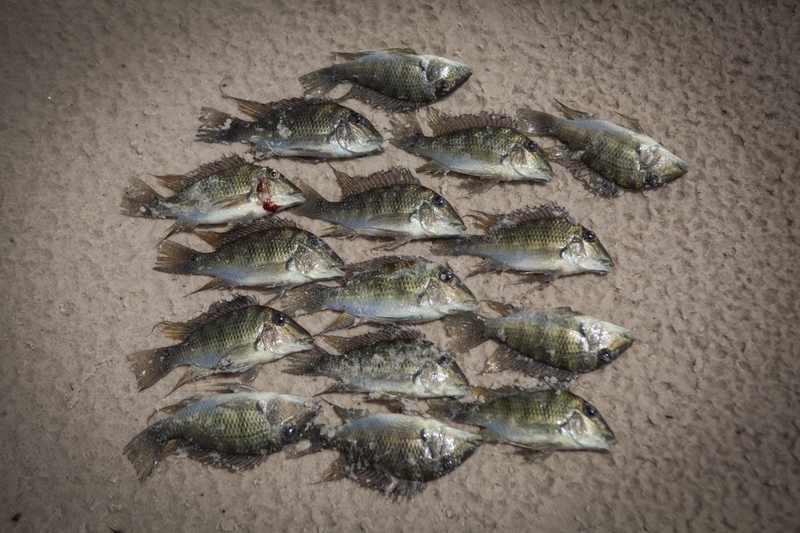 Bicudo is the main fish that the people of Queimada dos Britos breeds in the lagoons during the winter season. They breed them all year around in the only lagoon that exists during the dry season and then moves them to closer lagoons when the rain pours in and create lagoons closer to their homes. In dry season they have to make a two hours walk to fish in the sea. 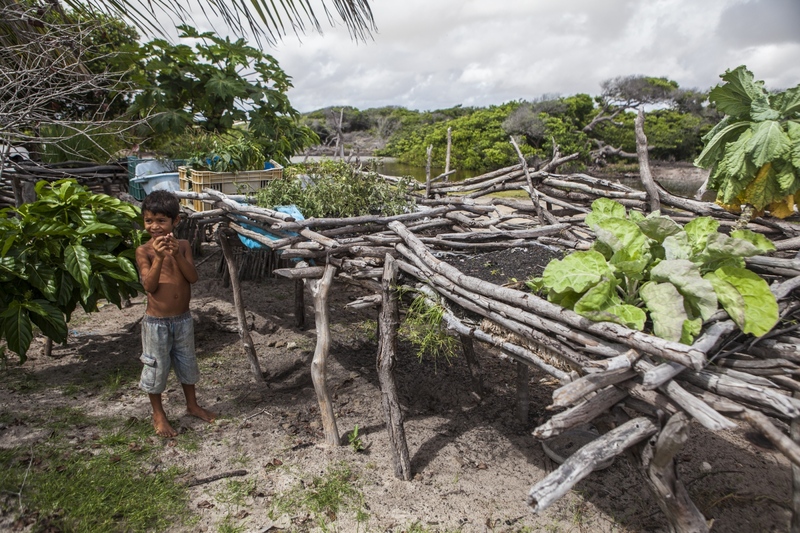 Julião Brito, 7, plays next to the small garden use to farm a few vegetables. 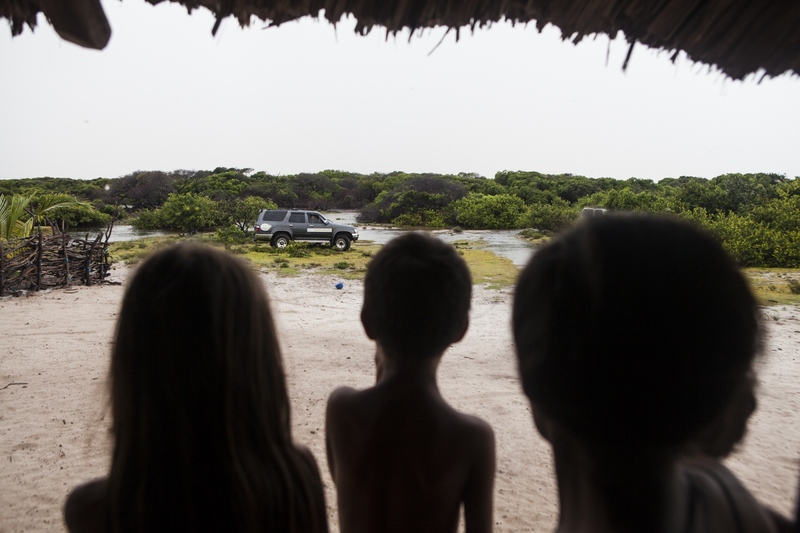 The locals of Queimada dos Britos don't grow many plots of land since they are afraid of the accelerating advance of the dunes that have already covered several houses. 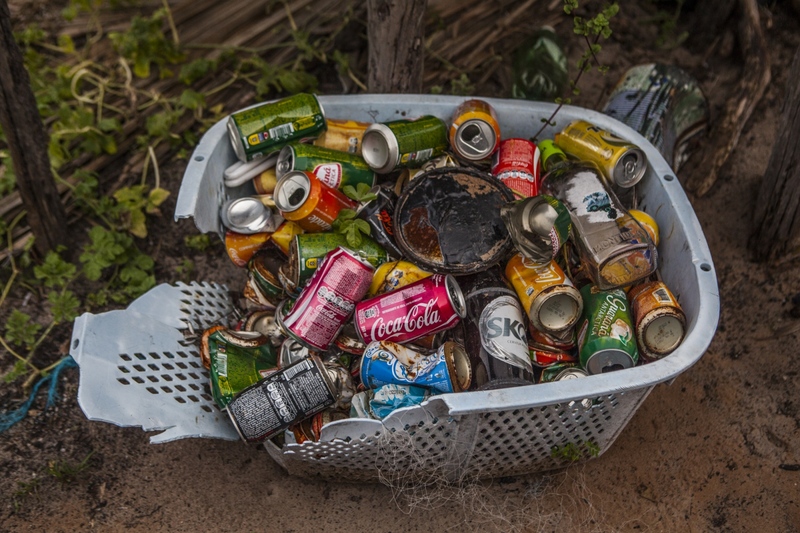 Basket of old soda cans sold to tourists that walked in to the Queimada dos Britos. Tourism is reaching the quiet life of Queimada dos Britos which is well received when the visitors walk in. Locals keep a stock of drinks that they sell to tourists as a way to make some money that allows them to buy some necessary products like clothes, coffee and rice. The downturn is that more and more agencies from nearby cities are bringing tourists into the park on motor vehicles that on the locals view are affecting environmentally the park and their peaceful life. Children watch a jeep with tourists pass through the community into the park. Tourism is reaching the quiet life of Queimada dos Britos, which is well received when the visitors walk in providing income to the community. The downturn is that more and more agencies from nearby cities are bringing tourists into the park on motor vehicles that on the locals view are affecting environmentally the park and their peaceful life. Adriel Brito, 13, points to the place where once was the house of his uncle. After he lost the house for the dunes he decided to move to the nearby city of Santo Amaro. During the summer, the lack of water and the strong winds make the dunes advance and take over parts of the oasis. But not only their life is threaten by the tourism and the sand. The Brazilian Institute of the Environment and Natural Resources (IBAMA) is planning to remove them since they live in a National Park. 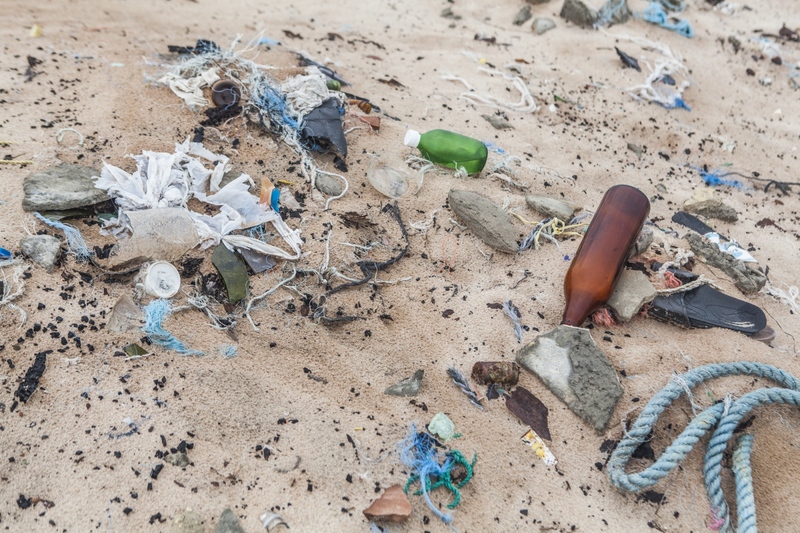 Debris left behind when the dunes swollen one the houses in Queimado dos Britos. After the resident lost the house for the dunes he decided to move to the nearby city of Santo Amaro. During the summer, the lack of water and the strong winds make the dunes advance and take over parts of the oasis. But not only their life is threaten by the tourism and the sand. The Brazilian Institute of the Environment and Natural Resources (IBAMA) is planning to remove them since they live in a National Park. 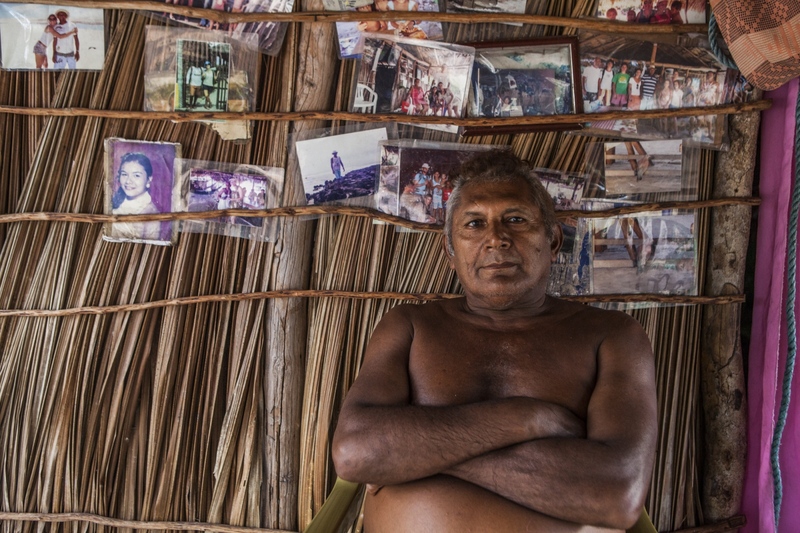 Raimundo Brito, 61, the oldest member of the Queimada dos Britos community, says "I will never leave the island even if they offer me a truck full of money". He was born in the oasis, lived all his life there and buried his father in the local cemetery. The Brazilian Institute of the Environment and Natural Resources (IBAMA) is planning to remove them since they live in a National Park. The residents refuse to move since many of them were born there and lived all their lives in the Queimada. They claim that more than a threat, they are a protection to the Lençois do Maranhão. 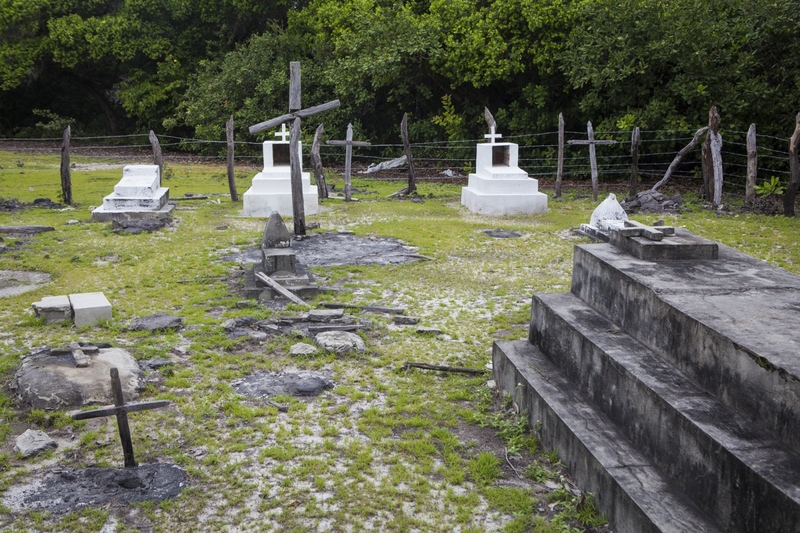 The cemetery of the Queimada dos Britos, where most of old residents are buried. It is one of the reasons why the locals don't want to leave the oasis. The Brazilian Institute of the Environment and Natural Resources (IBAMA) is planning to remove them since they live in a National Park. The residents refuse to move since many of them were born there and lived all their lives in the Queimada. They claim that more than a threat, they are a protection to the Lençois do Maranhão. 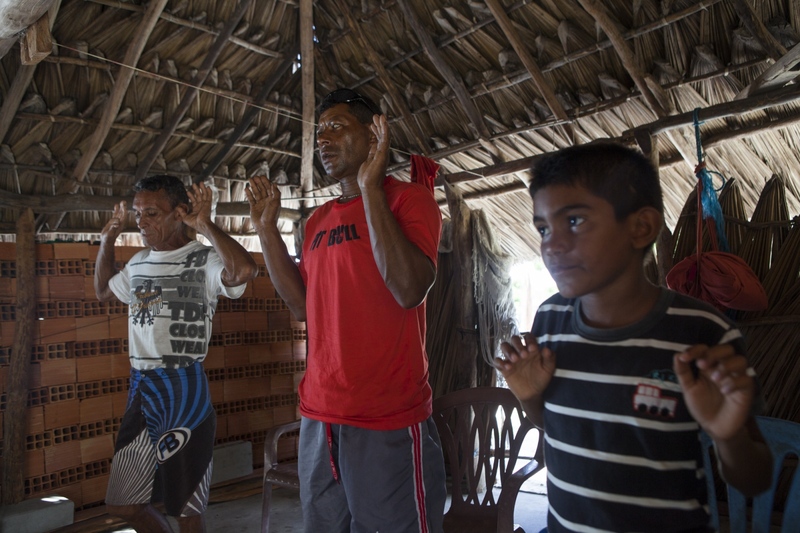 Eduardo, Zé Brito and Manuel Brito during the mass in the community shack of the village. Every weekend a few members of the community get together for the Sunday prayer. Aldemir Brito, 39, relaxes on the hammock while his son and nephew play with the dogs in the backyard of their house. During the afternoons the children are free to walk around the oasis and the dunes and adults tend to visit each other's houses and socialize. 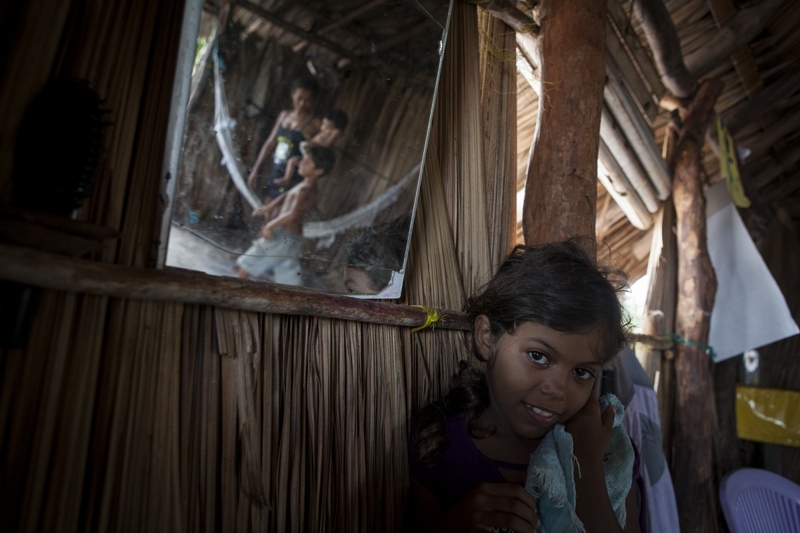 Rosa Brito, 7, in her house with her family. During the afternoons the children are free to walk around the oasis and the dunes and adults tend to visit each other's houses and socialize. Fabric hanging on a fence on the backyard of Aldemir Britos house at dusk. Auriela Brito has dinner with her sons, Tico and Adriel Brito. 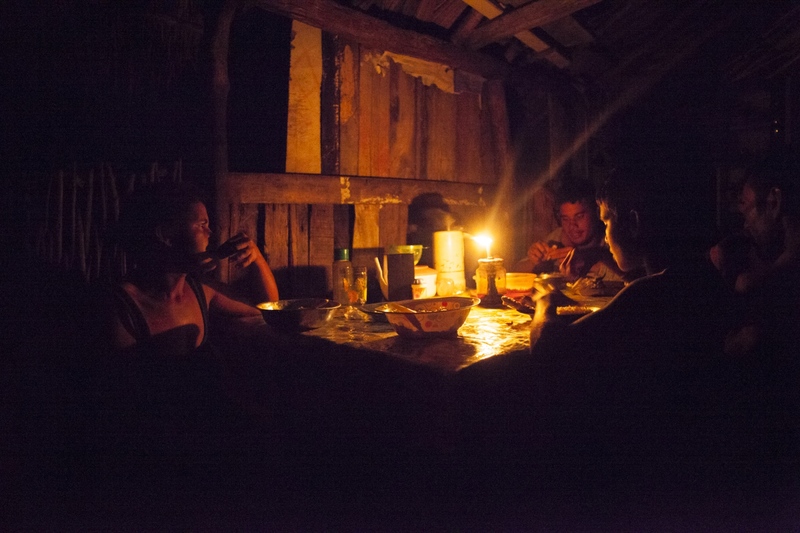 Electricity doesn't reach the Queimada dos Britos, so during the evening people relax and eat around kerosene lamps. 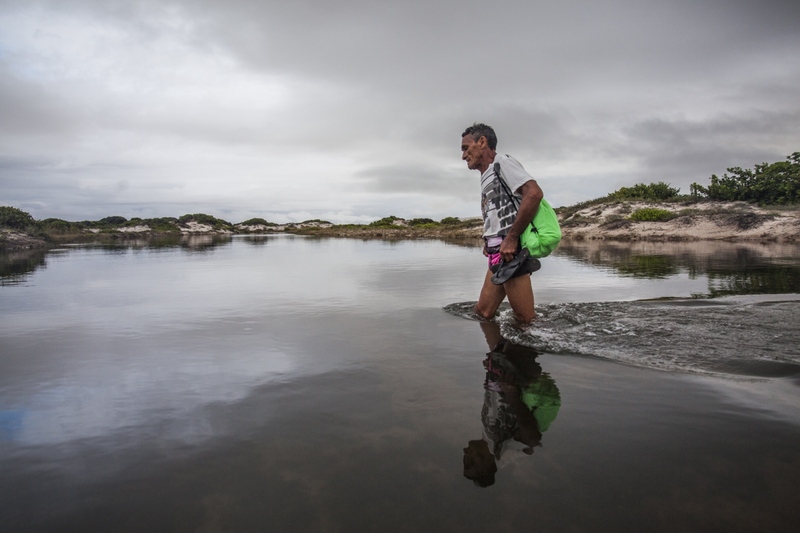 Eduardo, one of the temporary residents that comes and goes from Queimada dos Britos, crosses a lagoon during his 4 hours walk to the closest village of Sucuruju. He is going to pick-up medicine from a friend of the Brito's family. 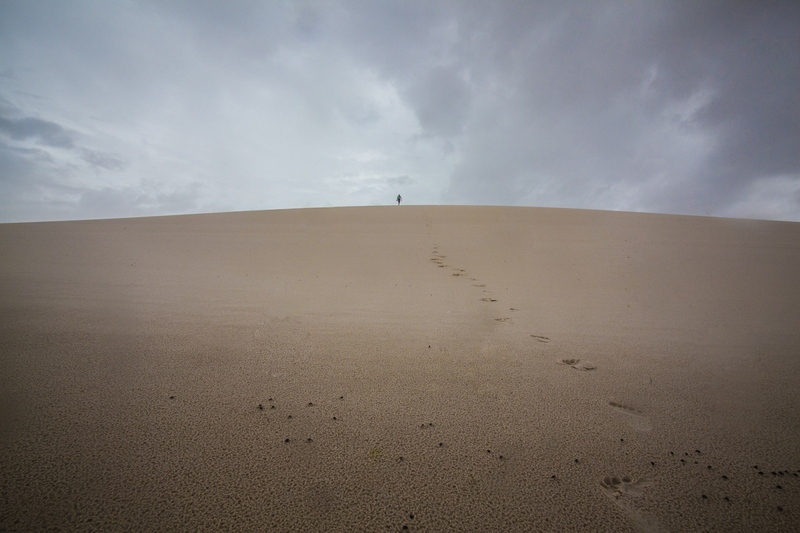 Eduardo, one of the temporary residents that comes and goes from Queimada dos Britos, on top of a dune during during his 4 hours walk to the closest village of Sucuruju. He is going to pick-up medicine from a friend of the Brito's family.